Hope everyone has been able to get out and catch a few trout between the heavy rain which seemed to have been around for the past week or so. I have been away in Thailand for the past week on a different fishing mission but was glad to see the lake when I returned home and found out the rivers had been high. All rivers are again fishing well and in the two days I have been home I have heard several very good reports from most waters. I was actually lucky enough to get out this morning with Dan from California and we caught a few decent fish in the high but very fishable Tongariro on small natural flash backs. 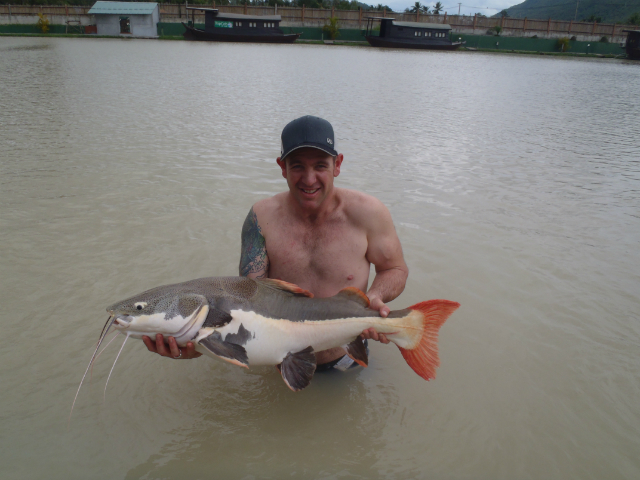 As you can see from the weird and wonderful photos which are attached in this blog I tracked down a bit of fishing in the muddy waters of Thailand which evidently held some amazing creatures which I really enjoyed catching for just a change. I have always enjoyed catching fish and fishing in general and the style and methods we used here took me back to early days with my Dad. The conditions were stormy, hot and wet but my brother and Dad settled in well in there prepared hutt and enjoyed the service of beer and burgers which were supplied at hand. Don’t get any ideas guys my guiding will never quite be this good and the fish never this big but I sure do recommend this style for anyone that has not tried it. In thisÂ stocked fisheryÂ there were 30 types of fresh water species which ranged from 20lb to 265 lb, apparently there were up to 3000 fish in this lake which may have been 5 acres or so. I don’t know alot about carp fishing or catfish angling but I was told these fish could be up to 50 years old and worth up to $50,000. I don’t need to tell you that this was strictly catch and release and evenÂ a quick photo was hard to get in with the guide being very mindful of the fish. I really didn’t wish to harm one of these amazing creatures and sure knew it was serious once signingÂ a disclaimer about how much I had to pay if one suddenly died. 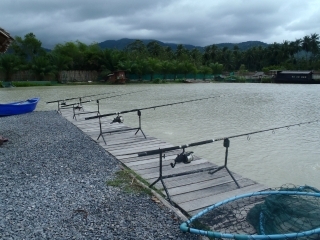 I believe that this fishery had some of the largest Carp in the world in it and it attracted many anglers from over the world to try their luck with heaving something from the murky depths. I thought this was going to be a walk in the park as we all know these Carp , Catfish and bottom dwelling monsters are ferocious feeders and scoff most things they come across but it seems I was so wrong. The gear was simple, a little like stray lining for snapper of the rocks but instead we used a huge tennis ball sized berley bomb attached to some corn and hoofed out into the middle of the lake while we waited for the ring of the bite alarm to go. These fish were not silly and we spent long periods wondering where all these fish were and I began to feel a little how many of my clients must feel some days.Â Our guide was very good and spoke English reasonably well and was a master of putting on the bait just right so it would not come of on our hard throwing techniques while trying to achieve maximum distance. I saw him laugh and grin as he watched my Dad and Brother miss there mark withÂ their casts, I know exactly how he feels. It was my turn to try and get close to where he wanted and I was miles of the mark with my first attempt so I retrieved mine and gave it another go wanting to get the hand of throwing a weight of a water balloon accurately! As we settled in with all 6 rods out and secured in the rod stands I hadÂ just whipped of my shirt when the alarm beeped and then turned into a steady beep which was exactly like a snapper running with it which I quickly tightened up on and engaged theÂ Â gear which in turn loaded the rod with an angry monster. The guide, the girls, the on lookers rushed around muttering advice a bit like I do I expect as this fish just pulled and pulled and pulled until it actually ran out of lake and surfaced on the opposite side. I slowly gathered a bit of line not really knowing what I was in for and how long I would be attached to this fish but instincts kicked in and it really didn’t play much different to any other sport fish. I must admit it was surprising to see 40lb line peeling from the reel while fishing fresh water with slices of corn on the end…but it was good I was loving it. After a while like all fish which are swimming around in warm chocolate milk the beast tired and was netted in strange fashion by quite an excited guide which told me it was a Red Tail Catfish and it was quite rare andÂ elusive to catch (sure they all say that). The style of netting was amazing with our guide rangi fully submerged in the water coming in from under the fish to secure it safely and cause no injury whatsoever….don’t expect this from me either. During the dayÂ we were all fortunate to hook, loose and land some really amazing fish with 4Â species ticked of the list of 30! !Â I was lucky enough to catch some really nice looking fish which included Leopard Catfish, Siamese Carp and the Red Tail Catfish my Dad andÂ Brother cleaned up the Giant Mekong Catfish. 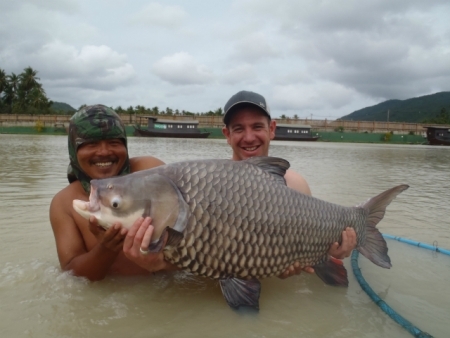 I have many favourites but for me the Siamese Carp put up the best fight and was the fish that grabbed my heart roughly weight 50-60 lbsÂ . As you can see photos were all taken in the water purely due to the size of these fish and minimizing injury to these valuable creatures, getting in the water knowing others to 200lb were in there was the hardest thing of all. 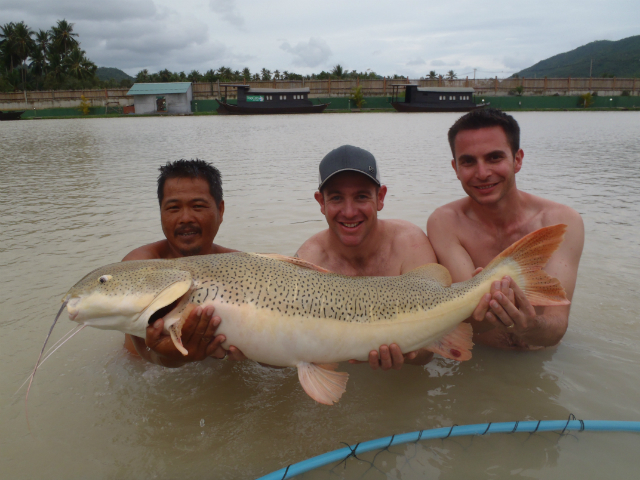 This was the high point of my holiday and I think about it still everyday wishing I could get back for another session and I would seriously recommend anyone going to Koh Samui to give Top Cats fishing a call and get into some of this action. I had better stopÂ speaking so highly of this fishery as someone might think it’s a good idea to release some in Taupo and see how they go?? As I have said the fishing locally has been very good and with good weather on the way and rivers dropping to a very good level the fishing will be hot for the weekend. 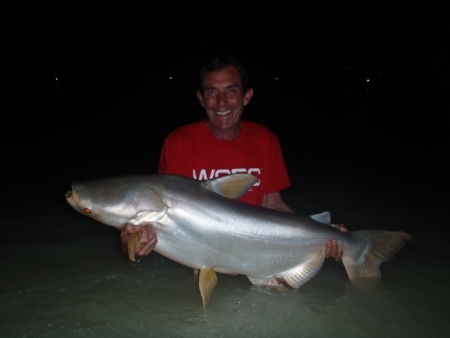 I am available to guide anytime so give me a ring and let me show you some new water you may have not fished or seen before! !